Homegrown cantaloupe is absolutely delicious and this is the second year in a row that I have had great success with growing cantaloupe. My knife sliced through the melon like it was butter. And the taste is sweet and juicy. I may never buy a cantaloupe from a store again. And I will certainly be growing them again next year! Usually I just chop the melon up and we eat with our fingers like it’s candy. On this day, a bag of tortilla chips was screaming my name. So I added a few ingredients to the melon and the salsa was fresh, delicious and totally addicting. 1 yellow or red pepper, chopped fine – I used my one and only yellow pepper that grew this year. 1-2 Tbsp pineapple sage herb, chopped fine – You could use mint or parsley. jalapeno, chopped fine – this is optional, depending on your heat tolerance. Combine all of the ingredients and mix together. This would go well on top of grilled chicken , or grilled salmon, or grilled shrimp. But on this day we ate the salsa with tortilla chips. 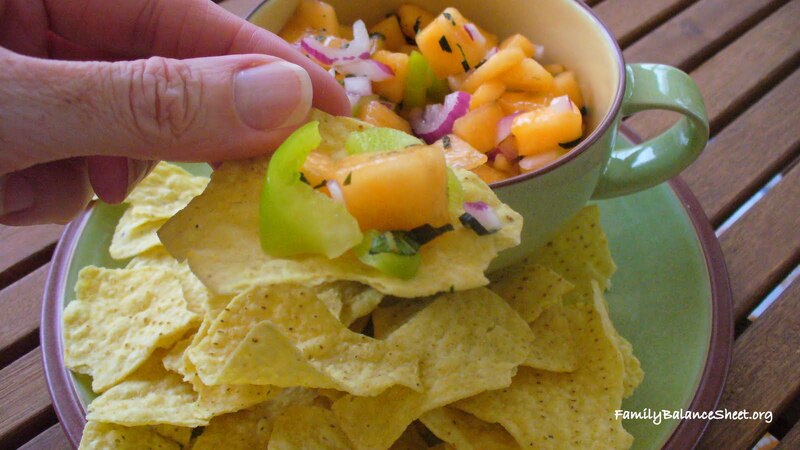 However you decide to eat Cantaloupe Salsa, please Enjoy! 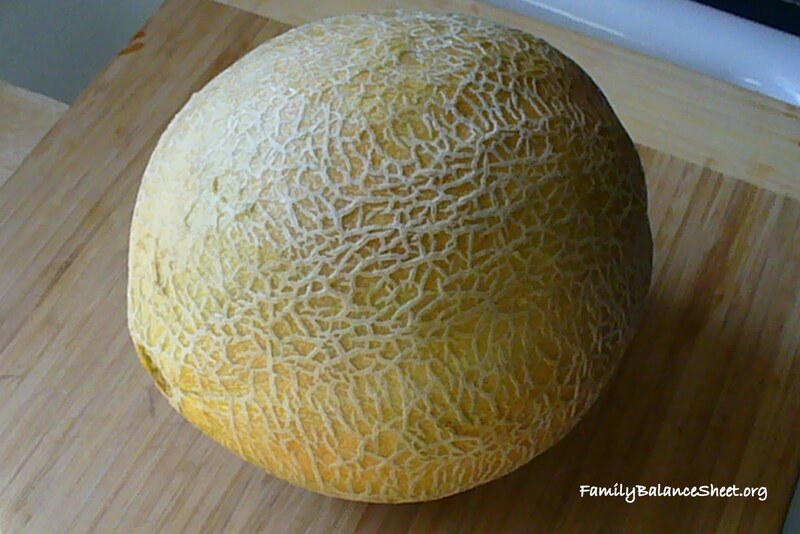 Such pretty cantaloupe! I am a salsa lover so thanks for sharing this unique twist!! Stopping by from Tasty Tuesday! 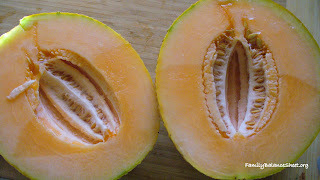 Our cantaloupe is really producing right now as well – we picked 8 on Saturday! I was looking for a new recipe – this looks yummy! I’m very impressed by your home grown cantaloupe – it’s beautiful! Unfortunately I will have to use cantaloupe bought from the market, but I will definitely try your yummy salsa! Looks delicious! Thnaks for sharing! I never thought about using cantaloupe in salsa – such an interesting idea (especially when those chips do call!! )… Thanks for sharing the recipe! I be this is refreshing! 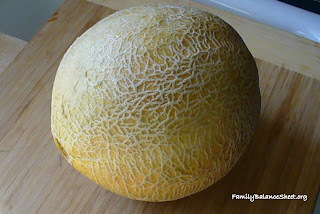 Cantaloupe doesn’t usually last for long in this house – we devour it so fast! Homegrown canteloupe *is* the best. I’ve never tried canteloup salsa though. Sounds amazing. And I’ve never met a salsa I didn’t love so I’m going to have to try this one. WOuld love to have you join me over at Vegetarian Foodie Fridays with this. Have a great day! Melodie @ Breastfeeding Moms Unite! So glad you came by! Thanks for sharing this! 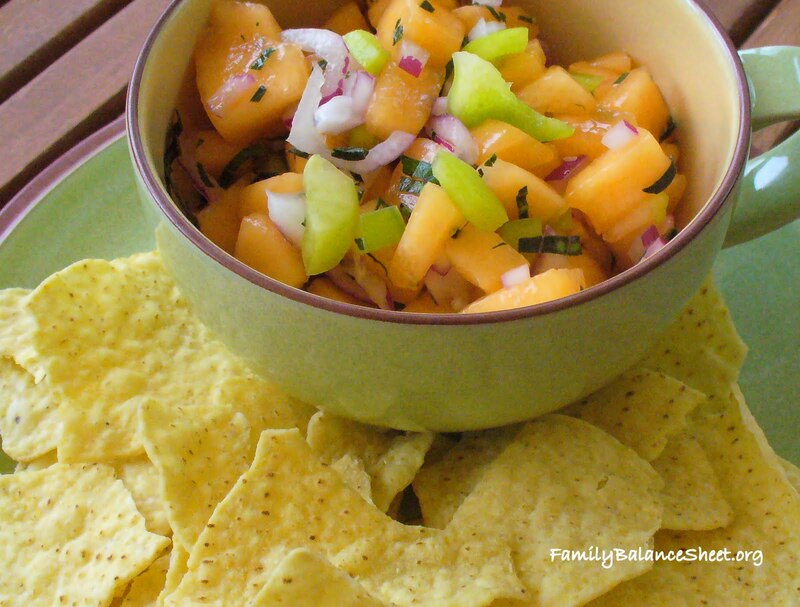 The cantaloupe salsa looks so good–you have inspired me to try growing my own next summer! Very creative use of cantaloupe! Thanks for sharing this at the Garden Party! Oh, yum! What a great idea! Thanks for the recipe.